If that is fine for you, there's no reason not to update. Anyways, I have to mention that this can change without a firmware upgrade! 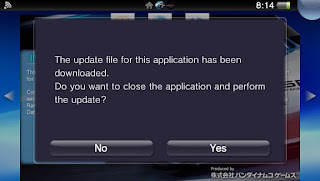 If you are online with your PS VITA, it can download and install silent updates for any application which runs in usermode and has nothing to do with system critical modules. The good is, those updates are removed once the system is restored to the current firmware, so it would not be a major problem to remove a fix. I just noticed the first update of the PS VITA game "Ridge Racer" is online and did some research on the new update system. Since there is a hash inside the link, it is not possible to lookup any game by it's ID, yet. The URL to the PKG update file may be stored in the first PKG mentioned above, as it's not in this "changeinfo"-XML.